It’s finally spring in Wisconsin. Even though the temperatures still dip into the 30s at night, the flowers are blooming, trees are leafing out, and, at long last, I can start thinking about planting my vegetable/flower garden. As I sat down to plan, I suddenly remembered that Mother’s Day is just around the corner. That got me reminiscing about Mother’s Days past. My Mother’s Day situation is on the unique end of the spectrum—it’s kind of a long story that I won’t go into detail with here—because I’m mom to one-and-a-half kids. See, when I married Phil two and a half years ago, I inherited his 3 children from a previous marriage (story here). Phil shares 50% custody with their mom, so we have the kids every other week. See how I did the math? 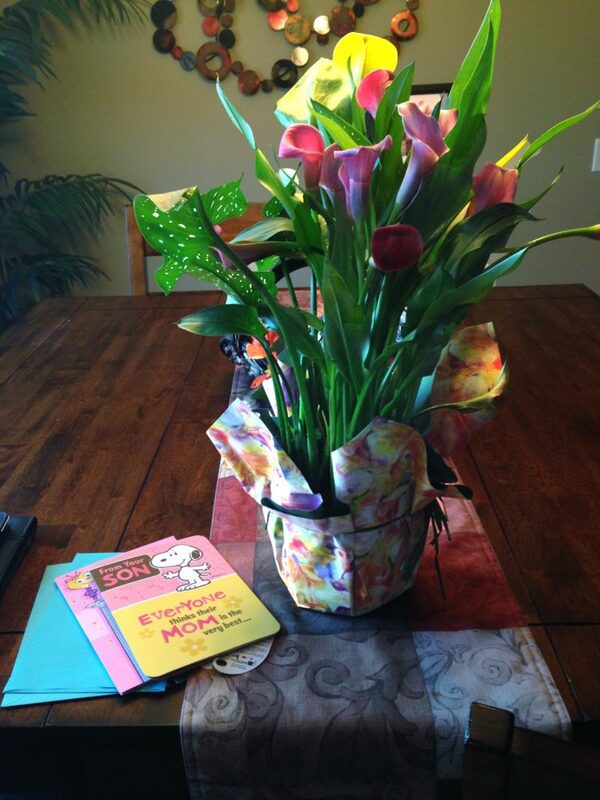 Mother’s Day 2015 was my first as the kids’ “second mom.” The kids have been wonderful and accepting of me, but stepmoms tend to take a backseat, so I didn’t expect—actually, it didn’t even occur to me—that the kids would think of me as a Mother’s Day-ish Mom. Of course, Phil and I both spend time with the kids, love them, make their lunches for school, cook their dinners, contribute to their parenting, and chauffeur them to and from school and sports practice—but I’m a new person in their lives. It’s a lot for them to swallow and I don’t take that for granted. So, on that morning, I had my Mom, Dad, and sis over for a special Mother’s Day brunch. To make the brunch stress-free (the Flipped-Out Food M.O. ), I worked ahead: I partially made a decadent egg casserole the night before, with hash browns, sausage, onions, red peppers, and cheese. It was a simple matter of mixing up the ingredients and baking. Also, since I anticipated that the kids might not be big fans of the egg casserole: it has “other stuff” like onions and peppers—thoroughly disliked by 1-2 of the kids, depending on…well, it’s complicated—I also mixed up the dry ingredients for waffles the night before. The next morning, I finished off the waffles while the egg casserole baked. I served everything buffet-style, with an “egg casserole” station and a “waffle station” including macerated berries, maple and chocolate syrups, whipped cream, and powdered sugar. Confession: this Mother’s Day Brunch was not a health-food fest. 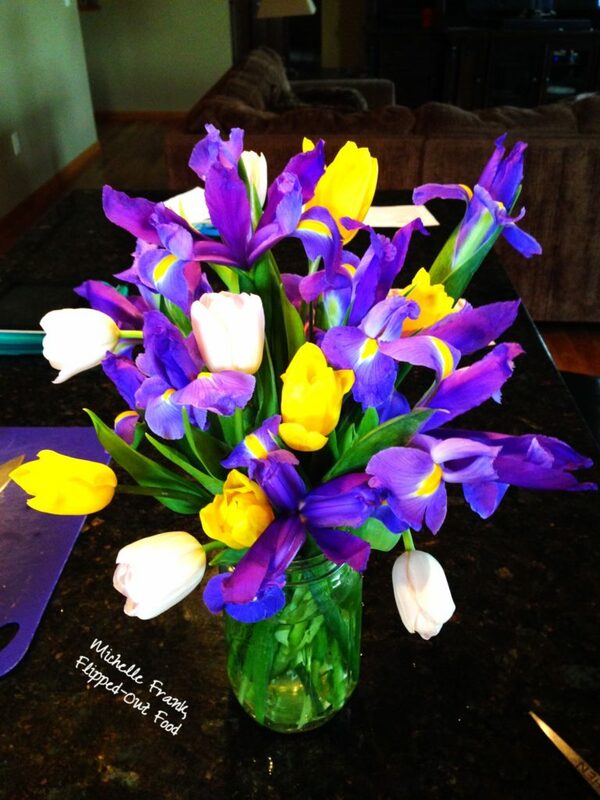 My sister brought fresh flowers, which I arranged in a vase before the ‘rents arrived. Mom loved the flowers and had a wonderful time spending time with us and her new grandkids. The DIY Mother’s Day Brunch bar was a hit, and I hardly had to do anything after everyone had arrived. Dad went downstairs after breakfast with the boys to play pool, while the girls watched funny animal videos on YouTube and laughed until we cried. The kids had written such beautiful things about how happy they were that I was now a part of their family and how much they all loved me. I’m getting verklempt even writing about it. Even though I know, deep down, that the kids love and appreciate me, it’s so wonderful that they went out of their way to tell me that on Mother’s Day. What a gift. I’m new to this whole Mom thing: it has been a challenging but wonderful experience that I wouldn’t have missed for the world. To all of you biological and adopted moms out there, I hope that your partner and kids let you know how wonderful and appreciated you are. I give you ALL a shout out. YOU’RE AWESOME. 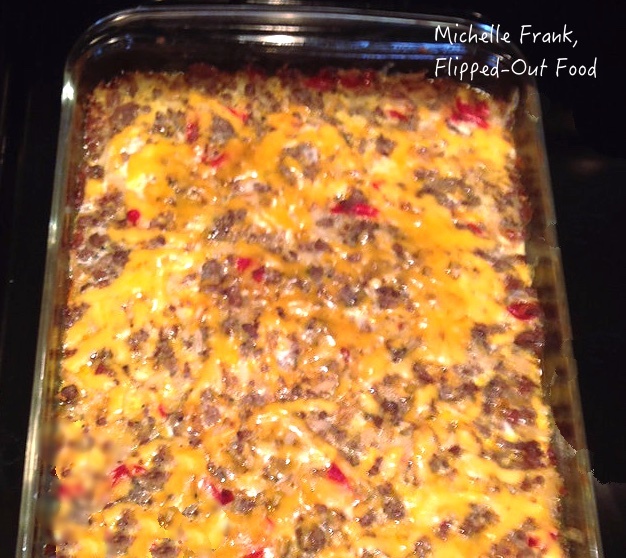 Breakfast Casserole: A make-ahead Southern-style Breakfast Casserole recipe with sausage, potatoes, onions, bell peppers, cheese, and eggs. Best-ever Waffles: These waffles are fluffy, crispy heaven pillows. They’re a bit of a production to make, but my “lower-chaos” strategy combines working ahead (mixing the dry ingredients and making the berry topping) with ingredient organization (everything is measured out and mixed according to bowls). I highly recommend mimosas for the adults! That was such a wonderful memory you shared with us… I think all families must be like that… It’s completely possible for love to grow and thrive without the necessity of shared DNA! Happy Mother’s Day! I totally agree, Tina! Thank you, and Happy Mother’s Day to you! how wonderful! those tulips are gorgeous & I love your buffet style set up. Thank you, Sue! I certainly am! What a lovely read and the menu looks amazing. This is perfect for a Mother’s Day treat! What great kids you have and very special mom you must be. How sweet! You are truly a lucky Mom! Those of us who gave birth to our children know that they don’t really have a choice but love us! Your kids love you by choice! Congratulations, Mom! Brunch looked fabulous! 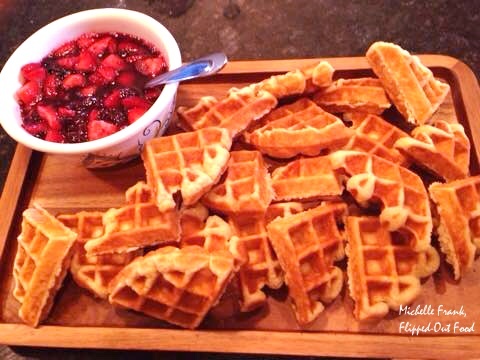 I love those waffles! Thank you, Beth. You’re so kind! Sounds like a wonderful mother’s day. 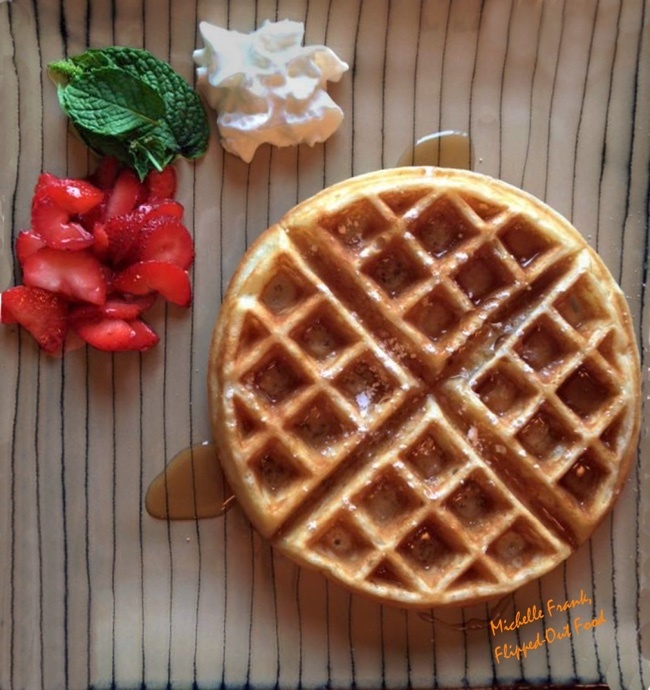 Those waffles look tasty! Thanks Cricket! It was, and they are! That was the sweetest story, thank you for sharing it with us. My eyes welled up for you, I’m sure that was such a special moment. Not everyone is as lucky to have a caring stepmom, thank you for being that gift to those kids. The brunch sounds special and yummy too.